Advocates from across Illinois visited the state Capitol this week to discuss a broad agenda of bills that directly impact the #LGBT community across our state, from HB217 ending harmful conversion therapy to a budget that protects vital services for all LGBT Illinoisans. 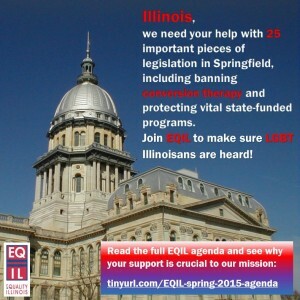 This year, we are working on more than 25 pieces of legislation that will advance full equal treatment and protections for all LGBT Illinoisans. The bill to protect LGBT youth from harmful and ineffective conversion therapy is teed up for a vote expected next week in the Illinois House. And a measure to enhance Illinois Hate Crime protections sailed through the House this week 112-0 and next sees action in the Senate.